explain how to use this application. This application is an application to manage files. manage folders in cooperation with the cloud system. check the contents of the file according to the type of file. preparing other data for linking data with an application created with abc3.me. inform you about applications that cooperated with future plans. Each button is prepared on the screen. A screen for linking with Dropbox opens. sign in and tap the reload button. 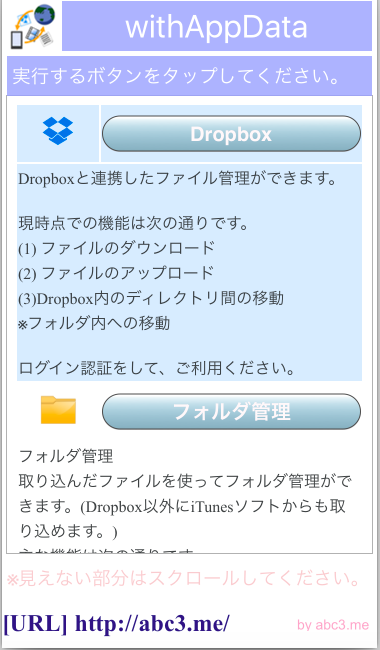 upload files managed by this application to Dropbox. manage files imported into this application. manage it for each folder. synchronize files using iTunes application and iPhone using USB. see the method after connecting the computer and the iPhone with USB as help. 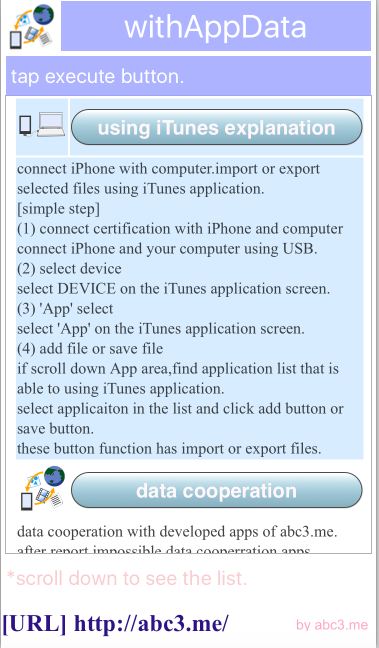 This is the function that prepared for data cooperation of the application developed by abc3.me. Although it is not data collaboration between other development companies and developers, it aims to be able to manage data developed by abc3.me in one with this withAppData. prepared shared folders, we make data collaboration between applications through this shared folder. it will report the application which can now link data.